he famous photograph on the right was taken in about the middle of the Twentieth Century. It shows one of the greatest puzzle solvers of all a time -- does he really need to be identified? -- enjoying a bike ride in Santa Barbara, California. 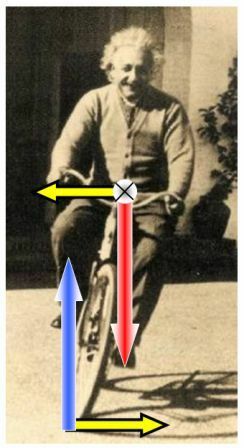 Albert Einstein seems to be demonstrating the solution to an elementary puzzle, how does a machine with only two wheels accomplish stability in its motion through space and time? "Of course," Professor Einstein seems to be explaining to us, "the bicycle does not ever travel in a straight line but must follow a curved pathway at all times either to the left or to the right, using centrifugal force to keep from falling. Like so, see?" alf a century later, a photograph shows this gigantic Airbus maneuvering for landing. It is banked into a left turn. As with the bicycle, weight W and centrifugal force FCENTRIFUGAL are both shown acting through the center of gravity. Unlike the humble bike, however, the Airbus has none of its many wheels in contact with the ground and must instead depend on aerodynamics to stay loft. The lifting force L always points perpendicular to the wings and can be assumed for this puzzle to act through the center of gravity of the aircraft. Not all of the lifting force is available to support the plane. 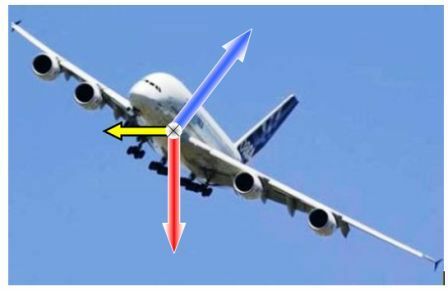 Only the vertical component of L overcomes weight W. The horizontal component balances the centrifugal force FCENTRIFUGAL, thereby keeping the plane turning. onsider a bicyclist riding along a highway at 12 miles per hour being overtaken by an airliner flying overhead on an approach to a nearby airport at 180 miles per hour. Hardly a fair race, of course. The bike requires five minutes to cover each mile; the plane, even slowed in anticipation of the runway, requires only 20 seconds per mile. By what distance? For how long? The expression centrifugal force is the subject of confusion -- even occasional controversy. You will find the terminology defined elsewhere as a particular kind of fictitious force also known as a pseudo force. Quite likely, even while riding a bicycle, Albert Einstein would prefer the more formal inertial force, inasmuch as real forces originate from physical interactions between objects. In this case, the real force is FFRICTION, which, being directed toward the center of curvature, might appropriately be labeled FCENTRIPETAL, while the fictional force FCENTRIFUGAL is directed away -- "fleeing" -- from the center of curvature and thus sharing a common root with the word "fugitive."